This what your NuWave Fitness Blog Ad will look like to visitors! Of course you will want to use keywords and ad targeting to get the most out of your ad campaign! So purchase an ad space today before there all gone! I’ve been doing the nsuns 5/3/1 workout from reddit for a good solid 5 months and while I really enjoyed the program there is some personal pros and cons to it and I wanted to explain why I won’t be doing it anymore either. For those interested I’ll try to briefly explain what nsuns is and if you want a more in depth walkthrough of the program check the reddit here. nsuns 5/3/1 is a program that condenses the 4 weeks of Jim Wendler 5/3/1 into one workout week. The workout sessions lasted me anywhere from 1hr 30min up to 2hrs on hard leg days with lots of accessories. I got a decent level of strength increase and some improved aesthetics. In the end going on the 6 day squat version with workouts taking up to 2hrs+ I got bored eventually. So now I’m doing a PPL with a few extra accessories. I will say that doing nsuns for a while has really helped increase my endurance as well. I used to be gased out from 1hr long workouts of lifting weights(like Greyskulls,Starting Strength). Now I often workout for 1hr 20min+ and still have some energy left. 4/5/6 day versions available depending on your schedule. You always feel like you’re progressing because you only do 1 rep+ at near training maxes. LP program means you are always increasing the weight if ever so slightly, compared to 5/3/1 which is usually an increase every 4 weeks. Massive amount of sets and reps gives you increased endurance and stamina after prolonged workout sessions. Can increase your strength rapidly due to the huge amount of volume in the workout program (IF you sleep 8-9 hrs+ and get in a surplus of calories). Something to do 6 days a week if you so choose and 1 day to rest or do yoga. A beginner can do this program(with proper guidance) but won’t be making max strength gains because this program is a mix of aesthetic/strength. Very long workouts even with super setting. Not very user friendly unless running an app or spreadsheet to track weights/sets ( I use Personal Training Coach app premium version). Can be overwhelming amount of sets and reps when first starting out. Need to read the reddit to find optimal suggested accessories to balance out the big amount of pressing movements. Requires you to be sure to sleep enough for growth. Requires you to be eating enough because this program becomes much harder on a calorie cut. Overall as you can see in my Pros/Cons listed that nsuns actually has a lot going for it but the cons could be huge for some people depending on their lifestyle. I was able to run the 6 day version for a few months before I went to the 5 day mostly. Eventually I got burnt out too with it but I might go back to it at some point in the future. I need to build my strength up more because I felt like doing 8 reps of a low weight bench press was not very valuable of my time when I could be doing a 5×5 heavier bench press set in PPL. Depending on your goals if you want a mix between aesthetics and some strength nsuns 5/3/1 is good. Here are some workout clips I’ve attached from my nsuns workout you can watch on youtube. Why I actually like working out? A few days ago I made a YouTube video talking about why I actually enjoy working out and the benefits I feel from doing such activities. The reason behind me wanting to make that video was because I saw another YouTuber actually upload a video talking about why they “stopped” working out. Their reasoning went into only liking to workout for girls and attracting women. I thought ” hmmm that’s an interesting outlook”. Me personally I feel totally opposite of that. I like working out because it makes me feel good, happy and satisfied with my existence in that moment in time. These are just a few feelings that come to mind when I just finish a workout. Now I usually workout pretty hard , my weightlifting days are usually 3-4x a week for 1hr – 1hr 15 minutes. I’m currently doing Ivysaur’s 4-4-8 program with added ab/stretch work during the off days. Notice how I don’t talk about ego or attracting girls is a reason why I like to workout. That is a side effect sure and girls liking that you are in shape is just a nice bonus. However, if you have an ego to begin with and are a jerk then working out will just make things worse usually. If you go into exercise with the wrong mindset you will do it for the wrong reasons. I never intend to workout for anyone else OR to impress anyone else but myself. The only person I can really control is myself and my actions. Working out keeps me grounded and focused . When I don’t workout or I start to miss workouts I become more sad, unhappy outlook on life and the list goes on.. I just wanted to share a few things about why I actually enjoy working out . I recently did a new 10 minute stretch workout that is dubbed “Manly” because of the specific groin exercises. This is the type of workout you can do before your main lifting day or even something to do when you first wake up to get you started for your day. AYL Sports Headphones , should you buy? About 2 months ago I bought some new earbuds on ebay because my old ones were in bad shape. The ear cushion had broken apart leaving little pieces of fake leather all over my ear and floor sometimes. Those headphones were decent and lasted a good while I guess but didn’t look all that great on the head lol (KINIVO BTH 240). Times change and I wanted an upgrade so I looked into the more common earbuds that are good for running and working out in. I didn’t want to spend more than $40 and after doing some review research and comparison I settled on the AYL Sports Headphones. They meet all the needs I wanted and were a great price as well. I paid about $22+ $2 on ebay since I couldn’t find a place to ship to me on amazon. You might be able to get it around the same price on amazon. I’ll list this a pros and cons of my thoughts of the product. Hands free voice dialing, power on/pause, volume up and volume down buttons which become forward and backwards on music tracks. If you wear glasses sometimes adjusting the earbuds will also move your glasses because they are both over the ear. Minor problem. Thats about it I couldn’t think of any more negative things but overall I am pleased with my purchase 2 months in already it is holding up strong. I do all sorts of workouts with these in and they never have fallen out before. Just make sure you get the right earbud size. The nice thing for me is I don’t even have to push them in that far for them to be secure. Some earbuds you have to cram into your ear but these just lay softly on the ear but you can also push them in further if you want for more noise isolation. If you’re considering buying here is an amazon affiliate link provided for you. 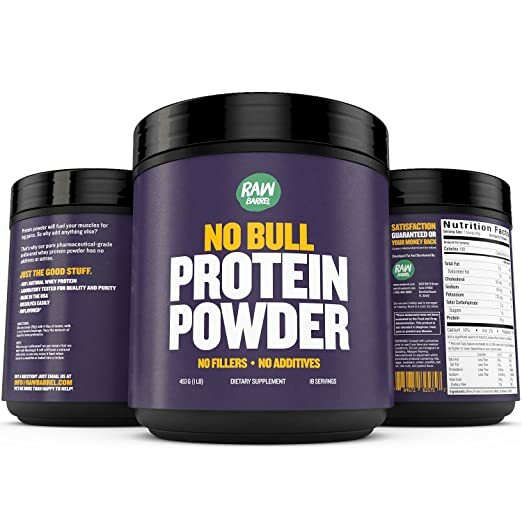 A few months ago I was contacted by Raw Barrel to do a product review and try out their protein powder NO BULL. I don’t take many supplements right now but I feel whey protein is essential for hitting protein intake each day for active individuals. The product arrived quickly and while it is unflavored basic whey protein there isn’t that much in detail I need to describe but I’ll go ahead and share my bit. The first few days I tried the product I did notice some heartburn and acid reflux issues which made me stop taking the product for like 2 weeks because it wasn’t fun trying to drink it down with acid reflux. After a short time it seemed to subside and taking the product again I had no further issues so that was great. I went through the whole container and my body and stomach all feel fine. Whey protein is a type of supplement that doesn’t really give you any visible results except for the small possibility of harder denser muscles I feel if you do work out intensely. Overall I’m happy with the product and would consider buying it in the future if the price was right. 20g of protein and 100 calories PER scoop. Consider this is comparable to eating a can of tuna in terms of protein/calorie ratio. This is much quicker and more efficient choice but shouldn’t be a replacement for food just a supplement in addition to. This product wasn’t flavored but as with most unflavored whey protein, you will still get a milky tasty however faint. Mixed pretty well with my blender bottle no complaints really it’s a small scoop so it should be easy enough to dissolve. Well, it’s a bit expensive around $28.39 for a 2lb container. $0.78 per serving? I’m guessing 36+ servings for a 2lb since the 1lb product I was sen’t said 18+ servings. The protein content per scoop is actually pretty low for a whey protein considering this is just a unflavored whey concentrate. If this was a protein blend of whey isolate/hydrolysate and concentrate then it would be around 30g of protein per scoop which would be better I believe. It’s not the worst pricing but the serving count is low. I would have liked a 2.5lb container for maybe $22-24 we should be getting a cheaper price especially if it is unflavored. In the final thoughts, this is a decent beginner protein for those who are new to exercising and want to just try a unflavored protein product. Disclaimer: this product was sent to me to review for free. However I value honest feedback so I was still open about my thoughts and opinions. The type of person interested in purchasing TribeSigns Wireless Bluetooth Kitchen Scale would be someone who enjoys counting their calories and knowing exact amounts of calories,macronutrients and micronutrients. Also someone who is more technically inclined and able to use a bluetooth device (iOS/Android/) to make the DietScale app work properly with this product. The TribeSigns Wireless Bluetooth Kitchen Scale has a nice sleek design that looks great on any counter. Accurately measures food in 5 different modes (g, oz, lb:oz, water (ml), water(cup),milk(ml) and milk(cup) by pressing the MODE button). Supports up to 11lbs/ 5kb in weight allowing you to measure and know the weight of a huge variety of items. Bluetooth Wireless App(DietScale) to download and use with this scale, allowing you to know exact break down of nutrients in any food item you wish. 18 month warranty and Hassle Free, Premium Lifetime Replacement Guarantee! At $30 roughly this is a premium product in the line of very basic kitchen scales. The highlights of this scale are the bluetooth features and ability to use the app wireless to get exact measurements and information on nutritional value of food. However the APP still needs a lot more work if it wants to compete or even be a replacement for users who already use other popular food tracking apps like MyFitnessPal/FatSecret/etc. If you are in love with the sleek design (white glass) then you might enjoy this value. Of course you will probably have the coolest “looking” Kitchen Scale on your street :). For simplicity’s sake it’s a tad expensive. I was sent this product to review and am very thankful to be offered this opportunity. I tried out all the features and gave my honest opinion in the Youtube Video below that you can watch (Yes I know it’s quite long but there’s always much to explain and test!). For those limited on time skip ahead to the following times in the video. If you are the owner of NuWave Fitness, or someone who enjoys this blog why not upgrade it to a Featured Listing or Permanent Listing?